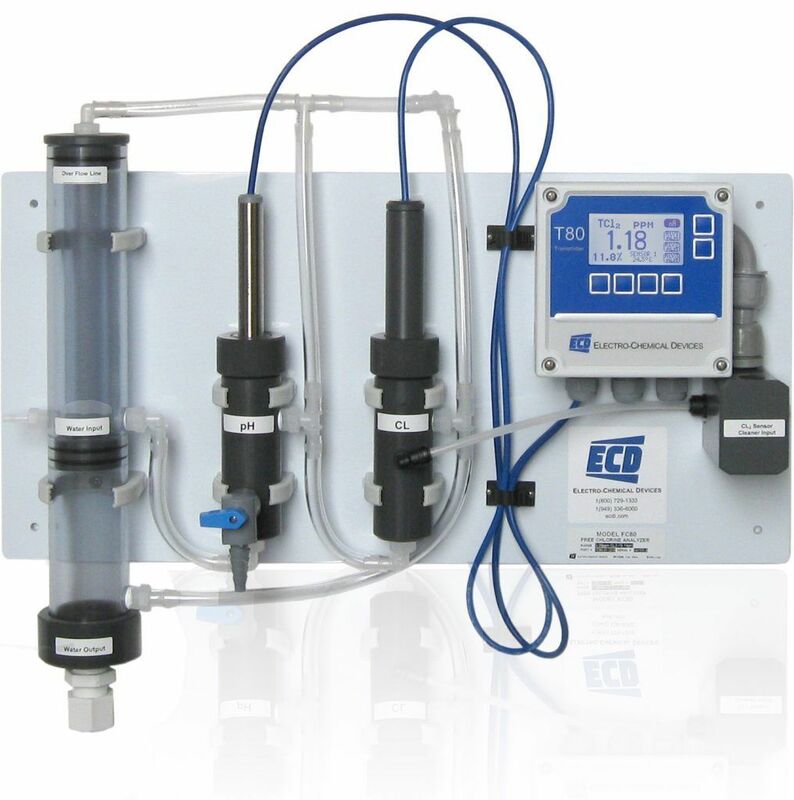 Industrial process and municipal engineers will want to learn more about the new plug-n-play TC-80 Total Chlorine Analyser from Electro-Chemical Devices (ECD), offering simplified water monitoring and treatment processes, easy installation and less maintenance for lower ownership costs. Highly reliable, the TC-80 Analyser monitors total chlorine in drinking water, rinse water, cooling water or other fresh water samples from 0.05 – 20 ppm chlorine as the standard range or 0.005 – 2.000 ppm with the low range sensor. Its plug-n-play design installs quickly right out of the box. The TC-80’s advanced panel mount design includes built-in flow control, which eliminates the need for complicated pressure regulators and rotameters. Built-in automatic pH compensation also eliminates the need for expensive reagents to reduce maintenance and life-cycle costs. The TC-80 features a panel mount design that incorporates a constant head flow control device, a pH sensor, a chlorine sensor and ECD’s T80 analyser/transmitter conveniently mounted on a PVC panel. Connect the sample and drain lines, next connect the power and outputs, and the TC-80 is ready to use. The TC-80 is calibrated at the factory before shipment. Calibration is accomplished by DPD comparison. Total chlorine is defined as the amount of free chlorine and combined chlorine in a water sample. Combined chlorine includes chloramines and any organic or bound chlorine compounds. The TCA Sensor is a three electrode amperometric sensor with a gold cathode, silver halide anode and 304 SS counter electrode. The TC-80’s pH sensor provides accurate compensation for samples between pH 4 and pH 12, eliminating the need for expensive sample conditioning systems to control the pH of the solution. Amperometric chlorine sensors are flow sensitive, the minimum required flow by the sensor is 0.5ft/sec, above this value the output is virtually flow independent. A “constant head” flow controller maintains the optimum flow by the sensor over a wide range of incoming sample flow rates. The minimum flow required is 10 gal/hr, and the maximum flow rate is 80 gal/hr with the sample going to drain at atmospheric pressure. The TC-80 Analyser is available with either 110-240 VAC or 24 VDC power. The TC-80 graphically displays both the Total Chlorine and pH allowing for easy trend analysis. The standard configuration has two 4-20 mA outputs and three alarm relays. The user friendly TC-80 is available with an Auto Clean option that includes a solenoid actuated spray cleaner using either 30 psi process water or air. An easily adjusted timer controls the period and duration of the cleaning cycle.